Osaka, known as Japan’s kitchen, is associated strongly with dishes like okonomiyaki and takoyaki, but did you know there are many restaurants that have tasty vegetables on the menu? Osaka has quickly grown as a travel destination in recent years. In 2017, Osaka’s airports were the most used throughout Japan by travelers from Asian countries. As a result, dining out establishments have adapted to these visitors’ needs by creating barrier-free, flexible menus.. There are many restaurants here with large and varied vegan menus. In fact, Japan’s first vegan hamburger and first vegan ramen shop are credited to Osaka. This article introduces some of our most recommended vegetarian and vegan-friendly establishments. 12 Meguri Meshi Megumi, Minamimorimachi/Ogimachi/Tenmangu – A Menu You Wouldn’t Believe is Vegan! You’ll be pleasantly surprised by the large vegan menu at ORIBIO Cafe Dining. Choices such as the Toro Yuba Omurice (1,050 yen excluding tax), featuring rice gently wrapped with fresh yuba, or tofu skin, from Kyoto, and the Chargrilled-Style Skewers (1,100 yen excluding tax) astonish visitors. Please note that the Tofu Yuba Omurice contains dairy butter, but can be prepared vegan upon request without the butter. 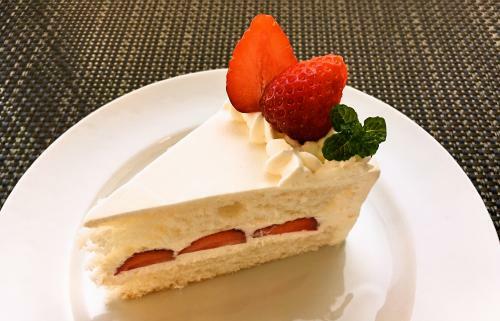 There are also other items on the menu, including the Seasonal Cream Cake, which contain dairy ingredients. ORIBIO Cafe Dining, does not use egg, animal-based and animal-derived ingredients as well as garlic, onion and the five pungent roots. Vegetables are organically grown and produced, and high quality seasonings and ingredients are utilized. You can also dine on superbly-delicious vegetables grown on the ORIBIO farm (agricultural chemical-free, herbicide-free, EM Farming, and open-pollination), dependent on the season. The restaurant building itself was also constructed and planned by ORIBIO. You can feel the great outdoors here from the walls constructed from diatomaceous earth, creating a relaxing space apparent upon entering. 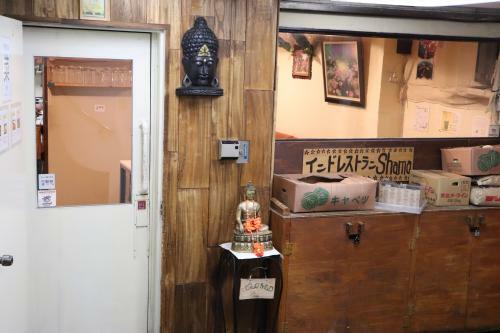 The name of ORIBIO is an abbreviation of the words “origin” and “bio.” The barrier-free food here can accommodate vegetarian, macrobiotic, vegan, plant-based, Halal, and Jainism practices. 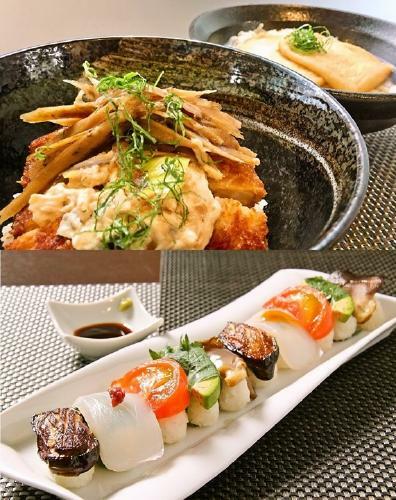 Items including the Yasai Sushi (vegetable sushi, 1,950 yen excluding tax) and Koyadofu Katsudon (breaded freeze-dried tofu rice bowl, 1,100 yen excluding tax) pictured above are highly recommended. 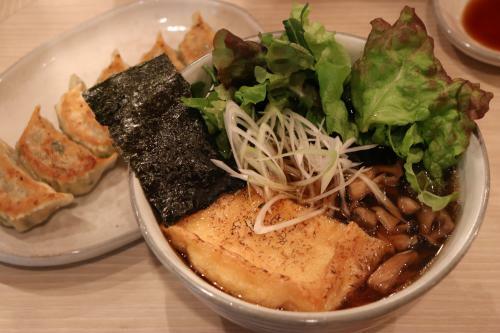 In addition, there are many well-loved dishes, including vegan ramen, that make this restaurant definitely worth a visit. The restaurant also offers high-quality ingredients and original ORIBIO-made ingredients for purchase. You can even learn from the restaurant how to recreate recipes using the original soy-meat for yourself. If you make a reservation up to one day in advance (by 9:30PM), you can receive 30% off a beverage per item ordered. Paprika Shokudo is a charming French-style restaurant. Created from the concept of beauty being linked by food and drink, Paprika is also popular and has been featured by many different media groups. The vegetables here are organic, no additives are used in the cooking process, and the seasonings are all handmade. You can dine on natural dishes that go against preconceived-notions of macrobiotic and raw food. 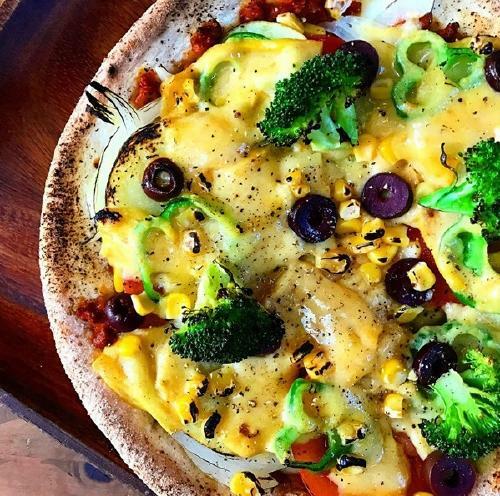 Paprika offers pizza, pasta, as well as other recreations of traditionally non-vegan dishes. Every dish is delicious, from Teriyaki vegan eel to vegan deep-fried oysters, to vegan omelette, making this a great spot to spend a meal with non-vegetarian friends as well. You can also enjoy this healthy food whenever you please, as take out is available and the restaurant closes at 11pm. 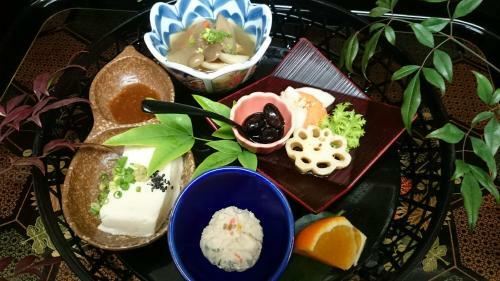 We also recommend the Shizensaishoku Lunch Plate (980 yen excluding tax), which features delicious vegetables. 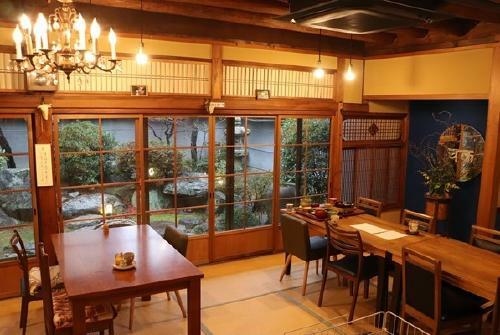 If you are visiting Osaka, you must visit Saishoku Wago Chakura, a restaurant inside of a renovated estate from the early Showa Era (around the mid-1920s). The couple who runs Chakura strive to best utilize the ingredients in their cooking and offer guests omotenashi, or Japanese hospitality. The husband shows off his creative cooking skills, and studied authentic Japanese cooking from the help of locals during his time studying in Australia. The dishes at Chakura are the perfect combination of colorful and beautiful, drawing out each ingredient from the seasonal vegetables. Various types of different plant-based soup stocks are used depending on the dish. Rare and less-commonly eaten vegetables are easily enjoyable and even can create nostalgic feelings, with a body-permeating deliciousness. 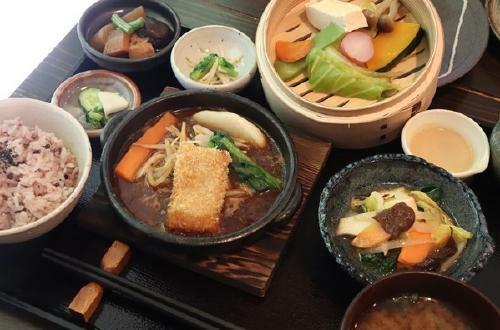 For lunch, customers can choose from a large selection including natural yeast pizza, curry, the monthly special of Ishirusansai no Zen, a plate of three dishes, and Yasai Zen. 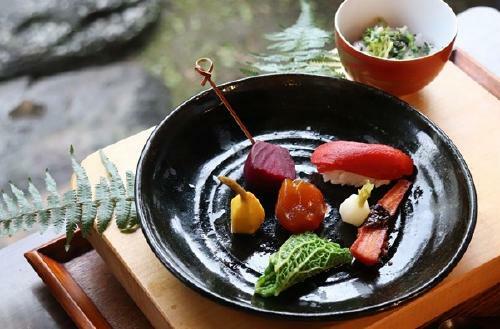 We especially recommend trying the Yasai Sanmi Course, or three taste vegetable course (reservation-only, 2,600 yen excluding tax) to enjoy a new take on vegetable-based cuisine. 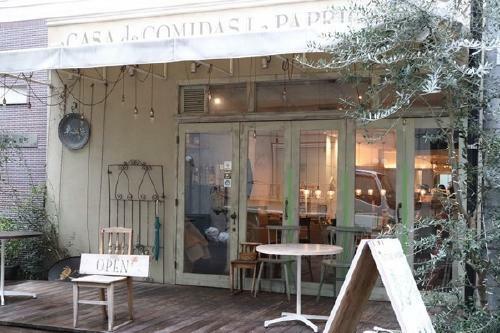 Atl is a hip cafe around three minutes from Shinsaibashi Station. Its casual atmosphere makes it easy to stop in even if you are by yourself. The dishes at Atl utilize in-season vegetables and cooking techniques that bring out the deliciousness of the ingredients. 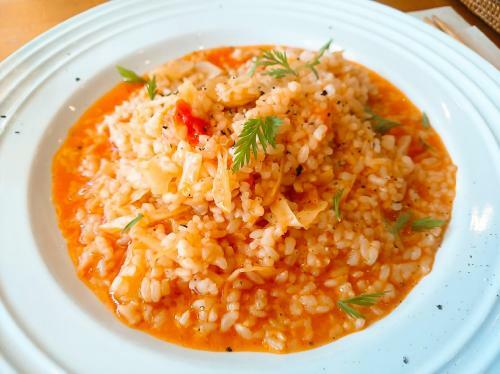 Pictured above is the delicately-flavored tomato risotto. 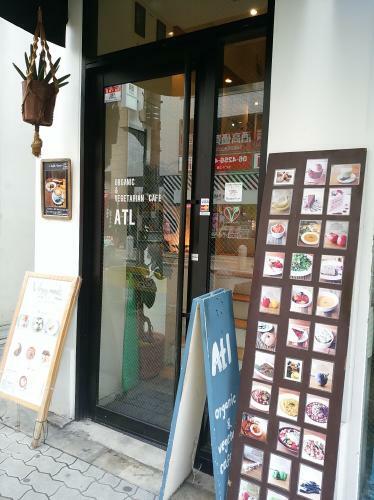 Atl began after the owner was moved by the taste of organic vegetables at another restaurant. Three years ago the restaurant began serving vegan dishes. 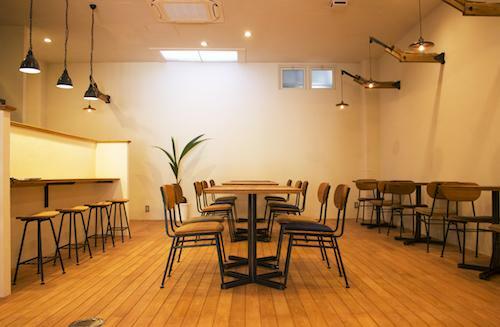 For lunch, you can pick a main, side, and a drink for 1,500 yen. For an extra 500 yen you can add a dessert. 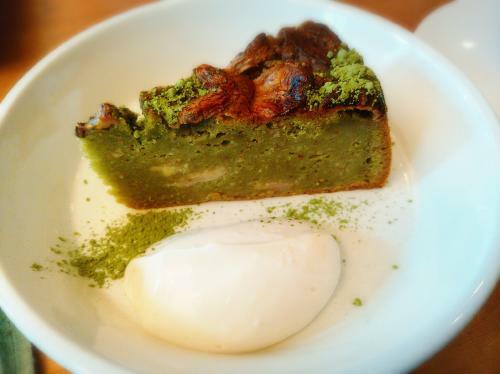 Photographed above is the green tea banana cake, which is not overly-sweet and has a mild taste. The creme is made from soymilk. How about taking a break from the city and relaxing with a cake or muffin? 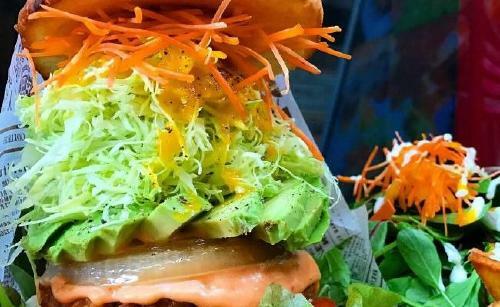 Western Japan’s first vegan burger restaurant VEGAN BURG KITCHEN is known for its extremely large burgers, nearly the size of what you might find outside of Japan. The soy meat patty is very satisfying and juicy, with a taste similar to meat. In addition to soy meat, customers can also choose from many patty selections, like konnyaku cutlet and tempeh. 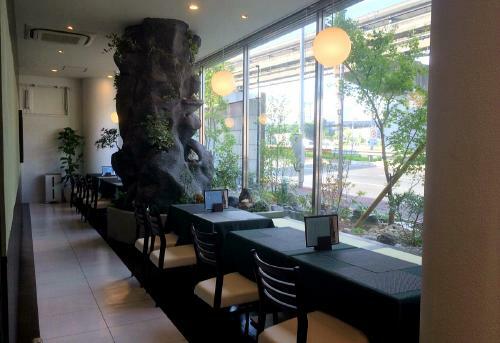 The interior of the restaurant is very stylish and photographs well for SNS. The owner apparently was inspired and modeled the store after a vegan hamburger chain abroad. The hamburger buns are also inhouse-made. The appearance of the burgers may look like typical junk food, but the dishes at VEGAN BURG KITCHEN are additive-free and wholesome. You can also order pizza here. With a delicious menu containing so many choices, VEGAN BURG KITCHEN is a great choice for all types of customers. Customers can also choose from a large side menu including Deep-fried Yuba “Fish,” Grilled Organic Oyster Mushrooms. You can also choose take out, which is great for parties. 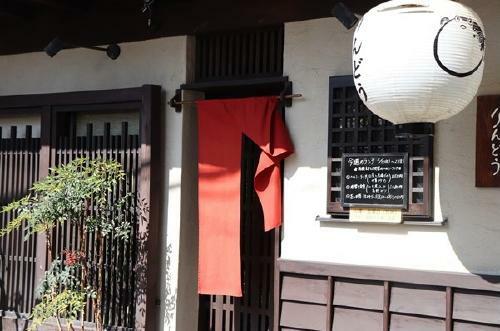 Shizensaishoku Rindou is a restaurant in a traditional Japanese house, operating Tuesdays through Fridays during lunch hours. In addition to prioritizing organic ingredients, dishes are additive-free and cooked without microwaves. 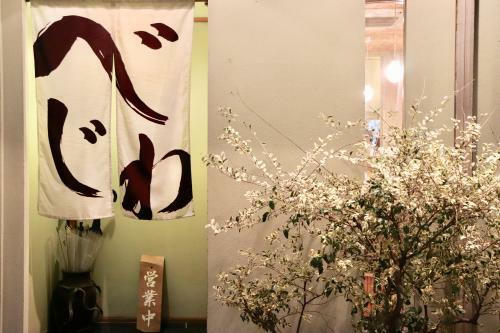 Rindou offers a traditional Japanese cuisine with its macrobiotic-based dishes using fine ingredients. You can enjoy weekly special set lunches of classic Japanese dishes, such as a Koyadofu cutlet simmered in miso, and a pork-like wheat gluten ginger stir fry. Many locals come here, wanting to eat healthy meals. Each dish at Rindou is prepared carefully and precisely, taking the different cooking time of each vegetable and ingredient into consideration. The Ladies Lunch (1,800 yen, tax excluded) pictured above contains three small varieties of main dish, and is recommended for customers who want to try several different things. Rindou also has a variety of merchandise for sale. 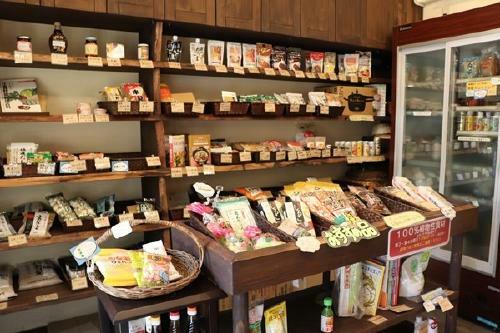 You can purchase safe and reputable food products and seasonings at Rindou. 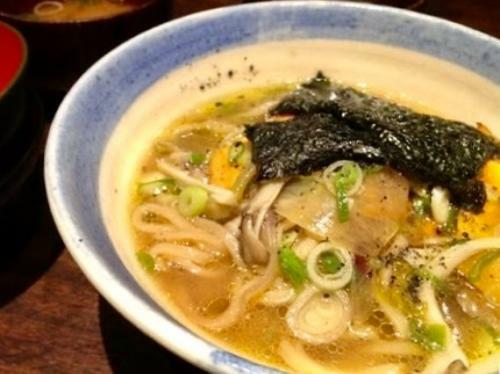 Japan’s first vegan ramen restaurant, Yuniwa Vege Ramen has chemical-free, good-for-you ramen. Operating until 9pm, this restaurant is frequented by people on their way home and is usually full with customers. The most popular dish is the Shoyu Ramen (920 yen, including tax). The flavor of the cedar box-fermented shoyu, or soy sauce, is brought out precisely by the use of plant-derived soup stock. Additionally, unique flavors like tomato and lemon sesame, as well as a seasonal ramen menu, make coming to Yuniwa enjoyable every time. What would a ramen meal be without gyoza? The texture of the crispy and chewy gyoza wrappers is truly addictive (6 pieces for 480 yen, including tax). 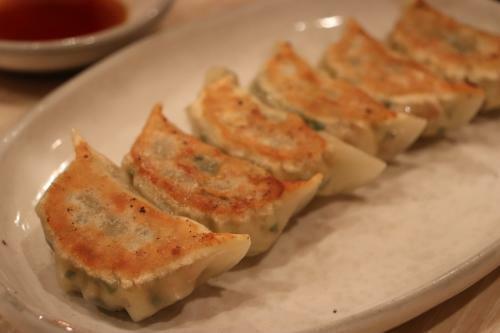 You will get hooked by the juiciness and refreshing taste of the vegetables in the gyoza filling. Yukichaya Ajari is a restaurant popular with a more mature crowd with its relaxing Machiya, or Japanese townhouse atmosphere. The previous-designer owner and her sister created this restaurant wanting to run a laid-back business. The owner of Yukichaya learned every type of cuisine and studied Shojin Ryori, Japanese Buddhist cuisine, through self-study. 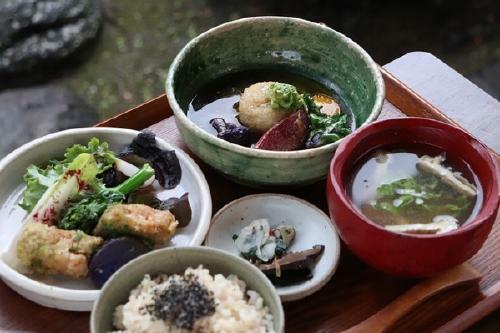 The menu features fresh and colorful contemporary Japanese Buddhist cuisine using mainly plant-based ingredients (a portion of the desserts and sweets contain egg, dairy, and honey). All condiments are additive-free and the vegetables are organically-farmed, chemical-free, and from Japanese farms. The Genmai Gohan Gozen, or brown rice meal (1,860 yen including tax), is a customer favorite. 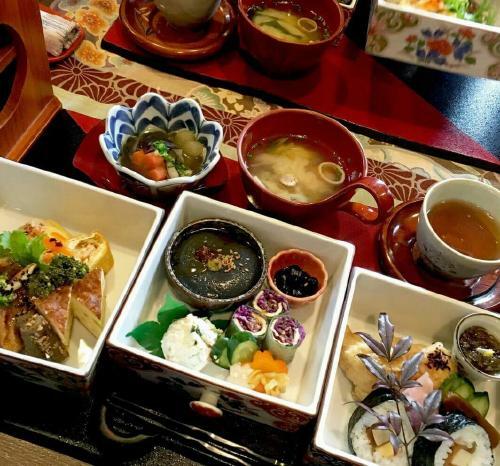 The daily special lunch (1,200 yen including tax) comes with brown rice, miso soup, and side dishes made that day, which allows customers to enjoy a variety of flavors. 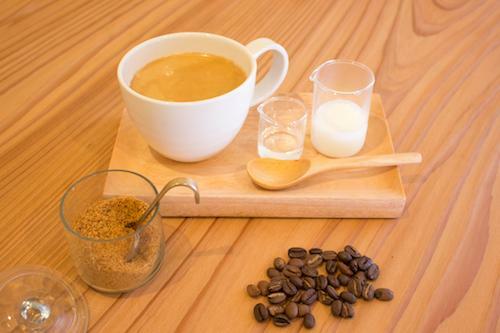 The home-made amazake has a delicate taste, brought out by the sweetness of the koji, or malt. Yukichaya was also selected for an excellence award in the 2017 Healthy Menu Contest by the Osaka Healthy Gaishoku Suishin Kyokai. 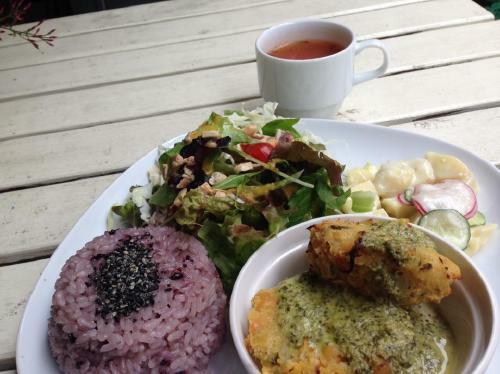 natural kitchen medaka #2 is a natural brown rice cuisine cafe with a large vegetarian menu. This restaurant has dishes and an atmosphere that support health and nurture the heart and soul. There are also events including free live performances and art lessons where you can truly relax. 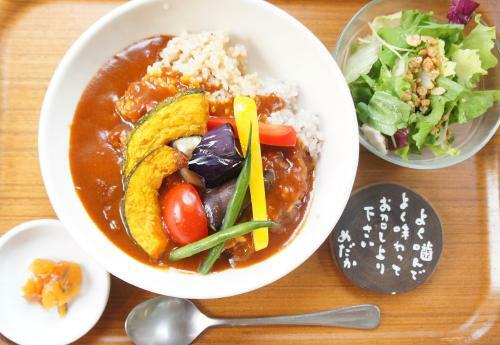 The 100% plant-based seasonal vegetable simmered curry (1,030 yen including tax) has been popular since the restaurant opened. Many varieties of roasted and fermented seasonings are added to flavor the fruit and vegetable base of this curry. 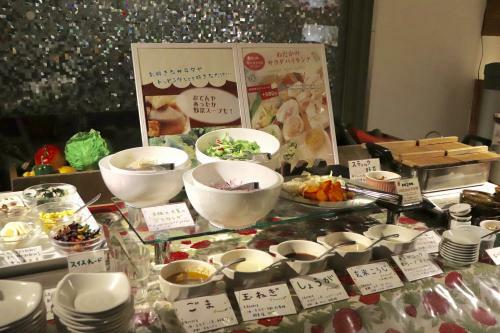 You can also enjoy the salad buffet for an extra 580 yen during dinner time. This would be perfect after a long day of work or walking around. 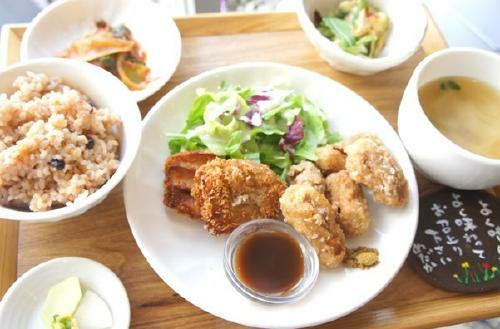 Pictured above is the fried wheat gluten and deep-fried veggie meat lunch (1,180 yen tax included). 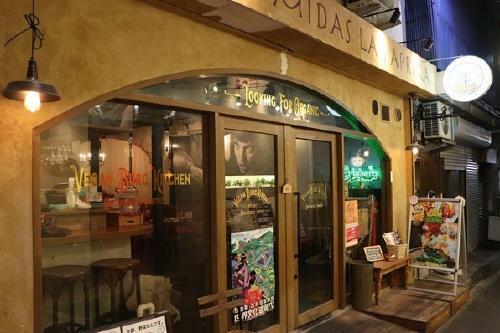 natural kitchen medaka #2 opened around 20 years ago when there were not many natural food restaurants in Osaka. 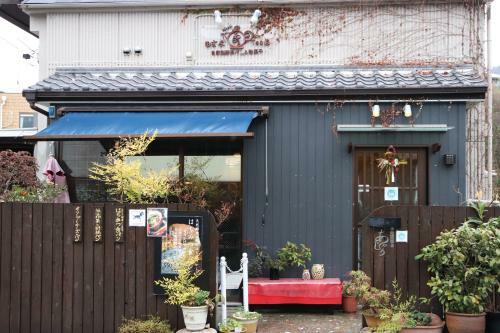 Vegetarian Cafe Green Earth has a long history in Osaka and has been open for over 20 years. One of the most popular dishes is the Daily Lunch Special (850 yen including tax). 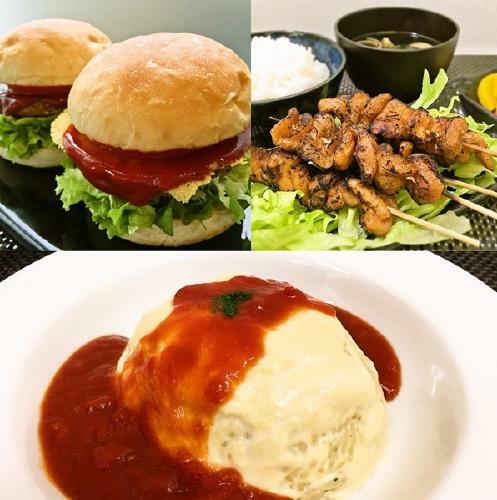 There are many enticing dishes on the daily menu, like the garbanzo bean burger and brown stew, which have captured the stomachs and hearts of many regular customers. The curry lunch (700 yen including tax) is an especially good deal and can also be taken out. With dishes like the hummus sandwich using garbanzo beans and lentils, you can taste cuisine from around the world at Green Earth. 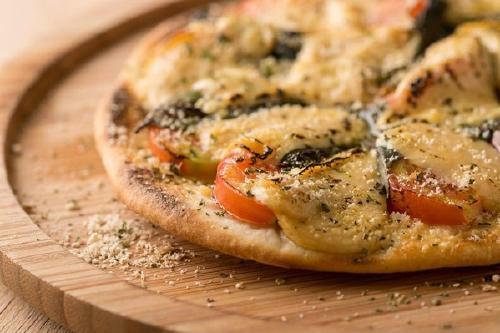 We recommend trying the crispy pizza with wheat germ crust. Omusubi, or rice balls, known as “Japanese fast food,” take the center stage at natural food restaurant GENMAI CAFE. The second floor is a natural foods shop selling brown rice enzymes, and also has space for seminars and cooking classes. 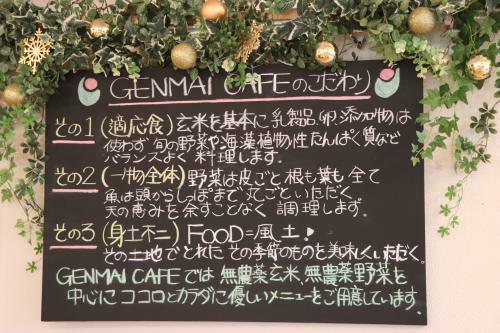 This cafe offers great natural dishes and is quite different than other omusubi shops you may find in Japan simply selling rice balls. Customers can select their favorite omusubi from around 16 varieties of organic brown rice balls for sale (150 yen each including tax). You can also choose from 5 different sets to add soup or salad from the side menu. The daily GENMAI plate (850 yen including tax) is also a tasty option. 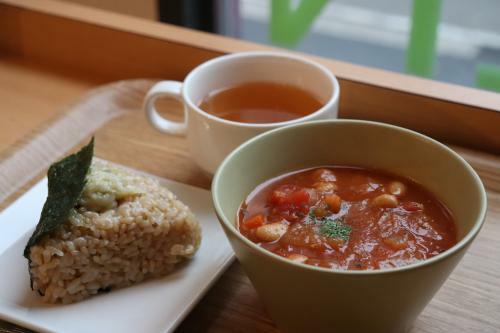 The time you can spend dining on the softly cooked brown rice, minestrone soup with hearty vegetables and beans, and organic onion soup is the definition of relaxing. Meguri Meshi Megumi, Minamimorimachi/Ogimachi/Tenmangu – A Menu You Wouldn’t Believe is Vegan! Meguri Meshi Megumi is a brown rice cuisine restaurant opened originally from health troubles from which the owner realized the importance of diet and self-healing. You can also reserve individual nutritional counseling here. Plant-based, satisfying dishes like the popular brown rice ramen (1,290 yen tax included) are part of the menu lineup. For customers wanting to get their fill of vegetables should be sure to try the daily set meal. The set meal (2,160 yen tax included) comes with three side dishes, a main dish, and miso soup, and customers can choose from either 38-grain sprouted brown rice, or half-polished rice with Malunggay herb. 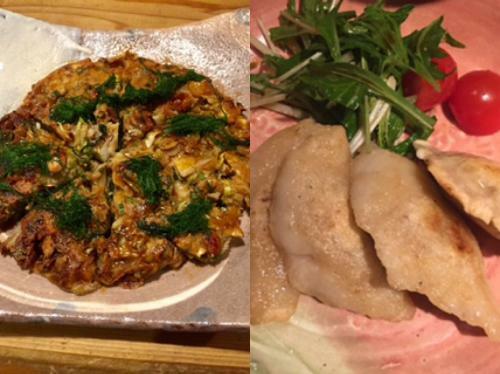 Pictured above is the buckwheat flour okonomiyaki (1,290 yen including tax) and gluten-free vegan gyoza (1,290 yen including tax). 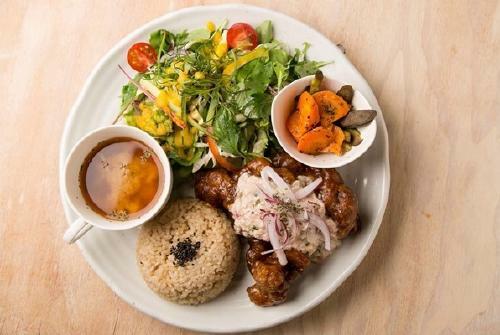 The food at Megumi is organic and 100% plant-based, chemical additive-free, made without blood-sugar inducing sweeteners, and uses buckwheat flour and active brown rice flour instead of wheat flour. 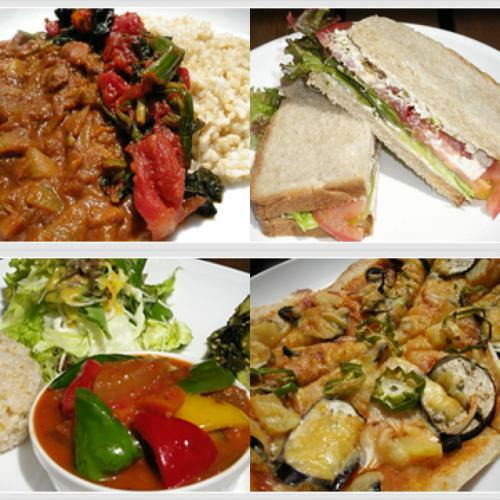 Megumi is a restaurant where you can come to and enjoy the delicious, healthy dishes made with safe ingredients. 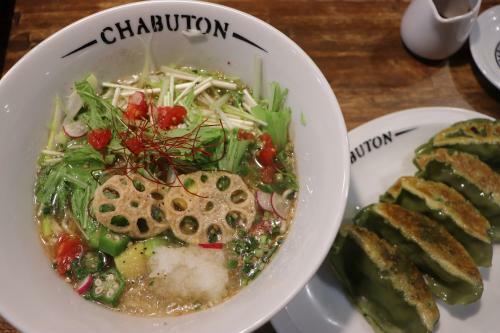 Chabuton is a Michelin-starred ramen restaurant with Shin Yasaikei Ramen available, which is vegan (750 yen including tax). Grated daikon radish tops of the dish, making it delicious and easy to eat for many customers. There is also the 5-piece veggie gyoza set (320 yen including tax) that is vegan-friendly. 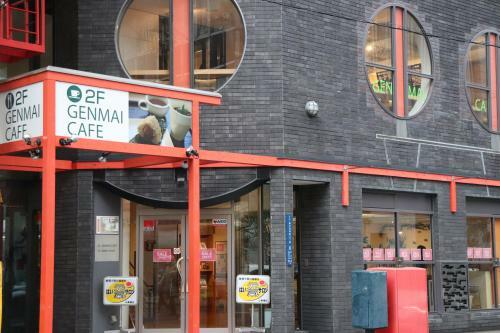 cocowell café is operated by the well-known cocowell brand. Customers here can receive advice on using coconut oil and cooking. The main focus of this cafe is of course, coconut! The food preparation and cooking here uses coconut oil and coconut sugar. The multigrain rice is also cooked with coconut oil, helping curb the absorption of glucose. 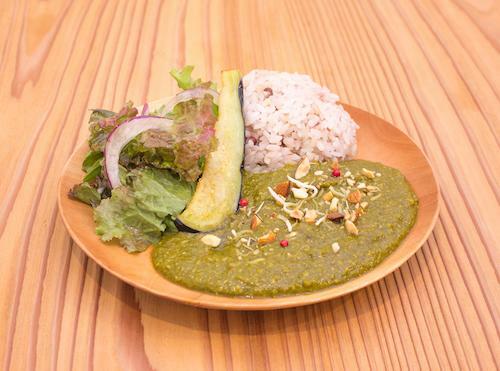 Pictured above is the vegetable spinach curry and salad (850 yen without tax). The use of coconut oil can be incorporated into a low-carbohydrate diet and is thought to slow glucose absorption. Cashew and coconut milk bring out a rich umami flavor in the dishes without the use of animal-derived ingredients. Look no further than Shama for vegetable curry. Here you can dine on vegetarian and vegan food with genuine Indian flavors. The fragrance of the spices in the air will definitely increase your appetite! 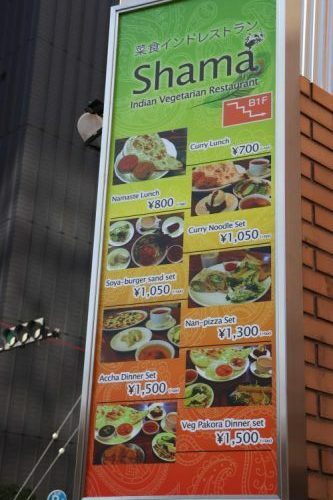 The menu has many fans, with dishes such as veggie momo (a dish similar to Japanese gyoza), curry noodles, pakora, and curry. The curry noodle set (1,050 yen excluding tax) includes an original ramen with tempeh and vegetables, veggie momo, soup, salad, and a dessert. Lunch is also reasonable, for around 700 yen excluding tax. 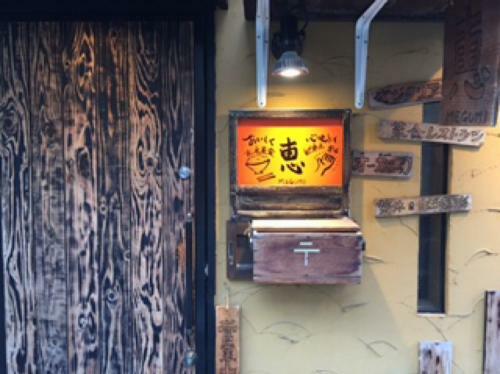 This article introduces only a portion of the restaurants in Osaka. However, many restaurants offer vegetarian and vegan menus, allowing both vegetarian diners and non-vegetarian diners to experience an enjoyable time eating out. 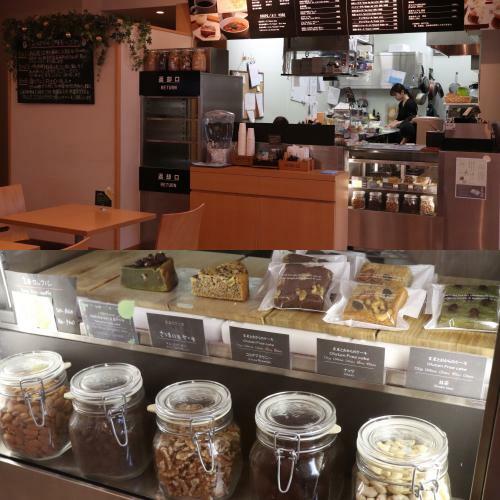 We think Osaka has made progress in barrier-free dining, and is an excellent city to explore plant-based dining with the variety of restaurants here. We strive to continue distributing helpful and healthful information, so if you found this useful, feel free to share this article!